la identidad que se rompe. Commissioned by pianist Susana Kasakoff for her CD Piano ex Machina. Premiered by Susana Kasakoff on February 15th, 2003, at Brechemin Auditorium, School of Music, University of Washington, Seattle. 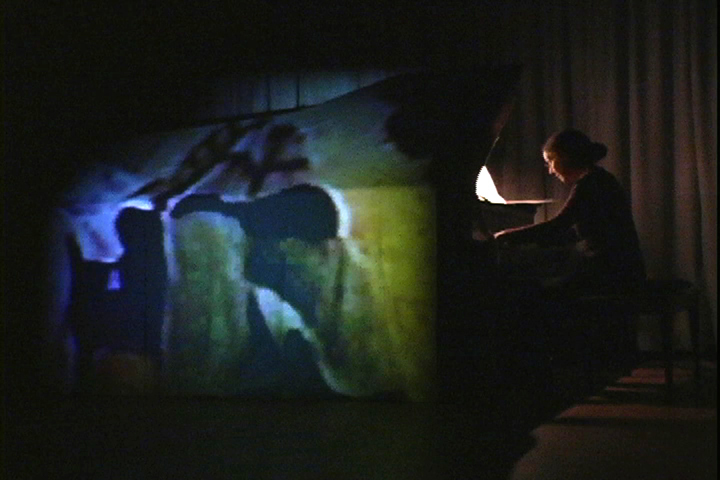 Argentine premiere by Susana Kasakoff on September 8th, 2004, at Manufactura Papelera, Buenos Aires. OID is a series of spiral variations of the piano version of the Argentine National Anthem, more precisely of its introduction: the one we used to listen to in our childhood, standing in the midst of school ceremonies, unmoved and in silence, before starting to sing. In OID, the piano assumes the form of an imaginary instrument, sometimes it becomes an orchestra, a carillon or perhaps a musical box, but always dark in color and distant. This extended piano is intertwined with processed recordings of the original version of the Anthem, played by a military band. The video layer of OID was created from film footage shot on the 26th of June, 2002 at the Avellaneda train station, minutes after the police murdered Darío Santillán. A twenty one year old "piquetero", Santillán was part of a massive MTD (Unemployed Worker's Movement) demonstration that was brutally dispersed by police and turned into a manhunt. He was shot in the back while trying to assist Maximiliano Kosteki, a comrade that had been shot in the chest and was lying on the floor of the train station when Santillán got there escaping police repression. In parallel with the music, the video shows a series of variations of the floor of the station, tracing the trails of the massacre. 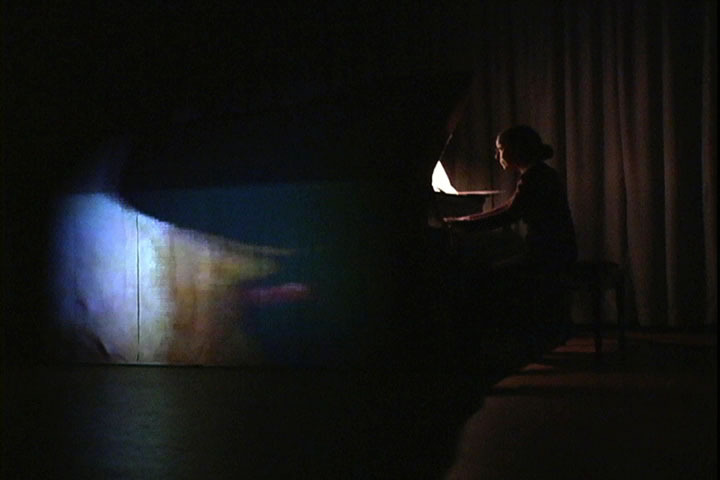 Both the sound and video layers of OID are "performed" by the pianist; the speed at which the sounds evolve as well as the timing of the video depend completely on her playing. To achieve this, a flexible real-time system was developed, which allowed control on many expressive parameters of the performer. The system mainly responds to her playing triggering particular transformations of the live sound, as well as changing the frame rate of the video, or freezing it at particular moments. 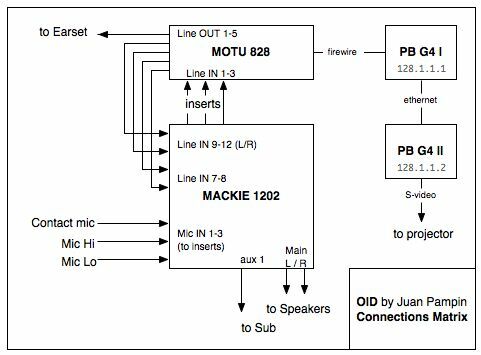 The implementation consisted in two computers interconnected by a network, the main computer doing most of the sound processing and sensing using SuperCollider (all sensing was done from audio signals), and also sending OSC messages to the secondary computer, which was in charge of video playback using MAX. 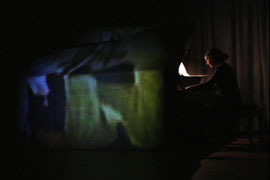 The video was projected on top of the lid of the piano, which was rotated 180 degrees from the audience and wrapped with a special fabric. 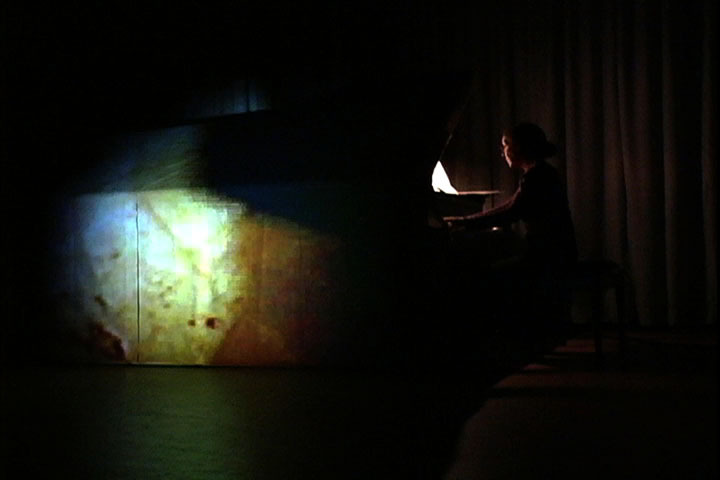 Beside acting as a screen, the fabric also covered the speakers which were set underneath the piano (two Meyer Sound UPM1Ps plus a UMS-1P subwoofer), this was done to create the illusion that all sound was coming from the instrument itself. Finally, a contact microphone was placed at the bottom of the piano, near the area low strings resonate on the sounding board. This microphone was used mostly for triggering and for processing sections where feedback was critical. The pianist also wore a in-ear talk-back system that allowed communication with her during performance (this was specially useful for the beginning of the piece when she needs a cue to know when she should start playing). Susana Kasakoff, Mirta Wymerszberg, Center for Digital Arts and Experimental Media (DXARTS), University of Washington. Left to Right (click to enlarge images):    Pictures from the premiere  OID connections matrix. "Una Patriada en Seattle" Seattle concert announcement from Clarín newspaper. "The Score" Seattle concert announcement from The Stranger weekly. "La Semana De La Musica Contemporanea" Buenos Aires concert announcement from Clarín newspaper. "Por Los Caminos Del Piano" Buenos Aires premiere review from Clarín newspaper. © 2007-2010 Juan Pampin, All Rights Reserved.